Ocean Marketing, a one-man PR firm led by Paul Christoforo, underwent instantaneous destruction this week, as we reported yesterday. It’s hard to judge precisely when Christoforo’s career ended: Was it after the heinously rude and offensive emails assaulting a polite customer? Was it the moment he told Mike Krahulik, the co-founder of the world famous Penny Arcade webcomic, Child’s Play charity, and Penny Arcade Expo (PAX), that he could attend PAX East whenever he so pleased? Perhaps it was when he name-dropped everyone from Cliffy B to the Yellow Power Ranger and the mayor of Boston? Regardless, the world was watching, ready to serve up swift Internet justice, and that’s exactly what it did. In a matter of hours, Ocean Marketing was trending across the Web, with Christoforo’s Twitter account being assaulted by angry and disgusted tweets, even going so far as to grab the attention of famous actors and car insurance companies. Christoforo’s YouTube account was overrun with dislikes and hundreds of comments mocking him in his own unique version of the English language. A parody reenactment had already been filmed, edited, and posted. Kotaku, in a rare moment of actual journalism, had seemingly uncovered evidence of Christoforo using anabolic steroids. 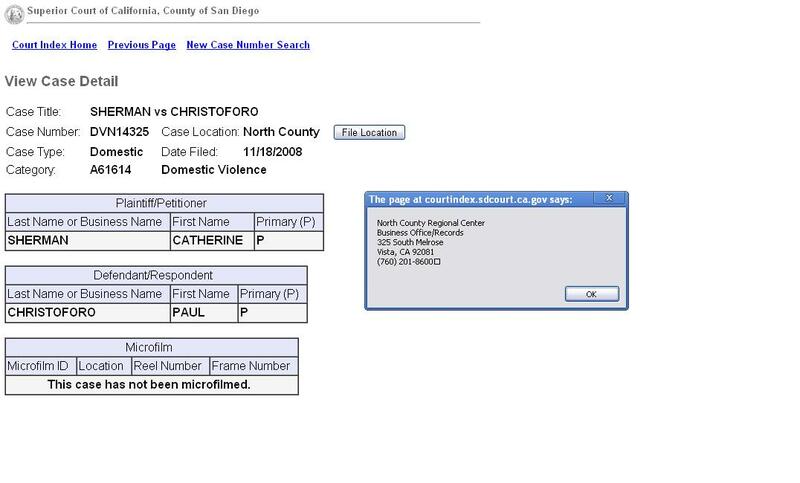 Internet sleuths were also quick to uncover a domestic violence case against Christoforo. And on and on it went. Christoforo’s actions not only destroyed his reputation, but also irreparably damaged that of N-Control and the creator of the Avenger Controller, David Kotkin of Kotkin Enterprises. The Amazon listing for the controller accessory was besieged by hundreds of 1-star reviews, while the Gamespot page was seemingly “terminated.” Reports of previous poor customer service and both external and internal sources citing N-Control’s constantly delayed product shipments began to surface. Miami, FL— Wednesday, December 28, 2011— N-Control, makers of the Avenger Controller accessory, have categorically dismissed third party contractor Paul Christoforo and his marketing operation, known alternately as Ocean Distribution or Ocean Marketing. This separation from Mr. Christoforo extends to all business interests of N-Control, its founders, and its officers. Mr. Christoforo does not and never did own, in whole or in part, a stake in N-Control LLC nor its affiliated companies (Kotkin Enterprises, iControl LLC). Following the publication of an email chain between Mr. Christoforo and one of N-Control’s customers, punctuated by Mr. Christoforo’s acknowledgement of his conduct, N-Control immediately proceeded to extricate Mr. Christoforo’s access to their email and social media accounts, a process that is still ongoing. In the interim, a Gmail address and Twitter account (AvengerDefender@gmail.com and @AvengerDefender, respectively) have been set up for press inquiries and customer service needs. David Kotkin, the inventor and founder of the Avenger Controller, created the product to help one of his students who had a physical disability. The student wanted to play games the way that everyone else could. The Avenger evolved from a homemade solution for a deserving child into an even more sophisticated controller accessory, capable of enhancing even the most skilled gamer’s performance. All existing orders will be honored, and PS3 Avenger pre-order customers will all be extended the same $10 discount that some have already received. To clarify, customers who have already received $10 off their pre-order are not eligible for an additional discount. N-Control agrees with “Customer Dave” that all of our PS3 early adopters deserve to be rewarded for their trust in the Avenger. N-Control would like to publicly apologize to existing and potential customers, as well as the gaming community at large, for allowing Mr. Christoforo to abuse his power so unforgivably. The Avenger was invented to provide greater accessibility to disabled gamers, and bullying tactics are the last thing that should be associated with this product. N-Control has hired an independent consultant, Austin, Texas-based Moisés Chiullan (@moiseschiu), to field press inquiries and oversee sales and marketing operations going forward. They ask that customers and the press alike bear with them as they field the tens of thousands of emails and other messages that N-Control has received. It is his intent that N-Control should respond personally to everyone who has emailed theinfo@avengercontroller.com address regarding this situation. All PS3 Avenger pre-orders are currently slated to ship by January 15th at the latest. Some orders will ship in advance of January 15th. In consideration of the events of the past two days, N-Control ask their customers to bear with them as they sort out updating individual order estimates. General updates regarding shipping will be regularly delivered to customers starting next week. At no time during his tenure with N-Control did Mr. Christoforo have direct access to customer credit card information. N-Control does not retain any customer credit card data for online orders, which are all processed via Google Checkout or Paypal. Ocean Marketing aka Paul Christoforo owns no stake in the Avenger Controller nor N-Control, and does not stand to profit from further sales of the device either through N-Control or authorized resellers. Contrary to how Mr. Christoforo may have presented events (in public or private), N-Control never directly endorsed nor had knowledge of his communication with customers in the manner found in his correspondence with “Customer Dave”, who still wants his Avengers, despite everything that has transpired. Steps have been taken to ensure that all future customer communication is transparently visible to management at N-Control. N-Control regrets sincerely that the trust they placed in Mr. Christoforo was so abused and betrayed and, as a result, may have tainted their reputation with existing and potential customers and partners. N-Control employs Eli Schwartz as a part-time Social Media Consultant. He is an enthusiastic high school student who became one of the Avenger’s earliest super fans, meeting the founder at a trade show. Mr. Kotkin is proud to encourage the development of a bright, enthusiastic young person like Eli. Eli Schwartz is not, however, in charge of Marketing or PR for N-Control. Previous news reports have credited him as Marketing Manager, a title Mr. Schwartz gave himself without the consent or advance knowledge or N-Control management. This occurred during the period of greatest upheaval following Mr. Christoforo’s dismissal, and N-Control regrets that this mixed messaging reached the public. All press inquiries and media requests should instead be directed to Moisés Chiullan at the AvengerDefender@gmail.com address. Contrary to rumors and speculation, Eli Schwartz’s Twitter account is his own and not controlled by Paul Christoforo. Mr. Schwartz is a minor, and consequently, N-Control would appreciate the press and the public’s discretion in their dealings with him. For the foreseeable future, N-Control’s official Twitter account will be “@AvengerControl”, as N-Control does not have access to “@NControlAvenger”. N-Control is not responsible for the content of any Twitter feeds associated with Paul Christoforo. For the foreseeable future, N-Control requests that customers discontinue use of the toll-free phone number displayed on the AvengerController.com website, as well as any other means of contact found there. Instead, customers should direct communication to AvengerDefender@gmail.com. They ask for patience due to the events of the last two days. Keep an eye on @AvengerControl on Twitter for updates. For more details regarding N-Control and Avenger Controller, contact press agent Moisés Chiullan, at AvengerDefender@gmail.com. The company gets points for an unusual amount of transparency, yet it doesn’t necessarily relinquish N-Control or Kotkin from any and all accountability. Given that someone as blatantly unprofessional as Christoforo was retained over a lengthy duration (and not just during the busy holiday period, as originally suggested), and was even being considered as a potential investor for future business endeavors, it’s hard to believe he was merely a rogue agent operating covertly. After all, the Avenger Controller had been covered by numerous media outlets and had a presence at both E3 and PAX, so this was not a tiny, independent operation.